Create NSW spoke with China Love director, Olivia Martin-McGuire, ahead of the film’s screening in competition at the 65th Sydney Film Festival. How does it feel to have China Love nominated for the Documentary Australia Foundation Award for Australian Documentary at this year’s Sydney Film Festival? I can hardly believe it. I am still kind of in shock from when we found out the documentary was the recipient of the Create NSW ABC TV Arts Documentary Feature Fund in 2017. Even though I have been working like a crazy human to make the film, I am still amazed that it will show in the Festival. It is wonderful. I hope a little bit of China life gets seen by unexpected eyes and minds. 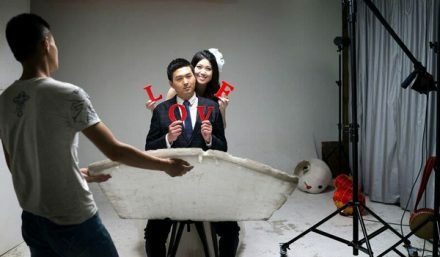 China Love is a continuation of your exploration of China’s wedding photography industry. How did you first come across the industry and what captivates you about it? I was working as a photojournalist and I arrived early for a job for The Australian Financial Review (AFR). I was actually shooting the director of Red Obsession in Shanghai at The Roosevelt Hotel on the Bund. I was taken aback by handfuls of bridal couples being photographed against the sandstone walls, and then picking up their dresses to reveal white sneakers and running to another wall to set up another photo. They were everywhere running, and posing, and then running again. I started photographing them and asking questions. I then pitched it to AFR and we did a story on it that then spread to a bigger project. What captivated me was the ‘white rabbit’ fantasy aspect of it. The colour and then the power of photography. Why were these photos so important to everyone? What role did they play? The answers I began to discover were very moving and I wanted to know more. I don’t think many Australians know the weight of China’s recent history. It is easy to judge China but really you just need to look back one generation and it is amazing to see how the country has changed that quickly in that short period. China is amazing. The film a feature length observational documentary. How did you find the subjects and what do they think of the film? We cast a wide net and found people through different channels. Mainly through friends and friends of friends. We were very lucky to find people who were happy to let us into their lives and trust us with their stories. China Love is made through the Create NSW ABC TV Arts Documentary Feature Fund. What made you decide to apply for this fund and how did you make your application stand out? It seemed like a good fit. We were already in conversations with ABC Arts as a potential interest and the documentary had such a filmic element to it that we thought we would try. We received development funding from Screen Australia to make a pitch trailer. This was incredibly helpful actually and, through our trailer, we were able to give a good taster of the filmic style and story. What advice would you give someone thinking of applying to this fund? I would advise filmmakers to go for it! You never know when the timing will be just right. It is an incredible opportunity if you have an Arts inspired story to tell. And a good solid pitch trailer can make all the difference in representing your ideas as best you can. Is there anything else you’d like to share about the films production? The film is made primarily by a team of women which we are really proud of, particularly in the current climate. As a first-time feature director, it was a true adventure making a film in a different language. Many a slapstick moment. Luckily, I had a wonderful and fun team. Amelia Chappelow was my first partner in crime – which was a lot of fun. Then when the money came in my sister Jack Martin-McGuire was the line producer. I really could not have gotten through the production without her. The team at Media Stockade were incredibly supportive and also helped keep the journey fun as well. I am hugely thankful to Create NSW, ABC Arts and Screen Australia for the opportunity, and am looking forward to showing this unusual and humane side of China that we managed to find on our adventure.